Microfiche are shrunken pages of information which have been put onto a film. They came about when companies had a lot of documents or files but didn't really have the space or wanted to save a lot more space in and around their offices. In effect microfiche were the external hard drives of those days, a way to save larger files in a small place in order to save space. At the time it would've been truly revolutionary so, as it turns out, we were thinking about saving space long before the advent of the 21st century, although not as obsessively as we do today. Microfiche are flat and small sheets of microfilm on which newspapers, manuals, books, newspapers, and other documents can be photographed in reduced form. Their original documents are usually about ISO A6 paper size (105 X148 mm). A single Microfiche can have a mix collection of microfilm images. All microfiche are read with text that is parallel to the fiche's long side. Frames can either be portrait or landscape. A title may be recorded along the top of the Microfiche for identification purposes. A 10 x 14 mm portrait image is the most commonly used format. Magazine pages or office size papers usually require a reduction of 24 or 25. Microfiche is usually stored in open top envelopes. These envelopes are either put in boxes or drawers as file cards or fitted into pockets in purpose made books. These are the types of Microfiche scanning services that we offer. 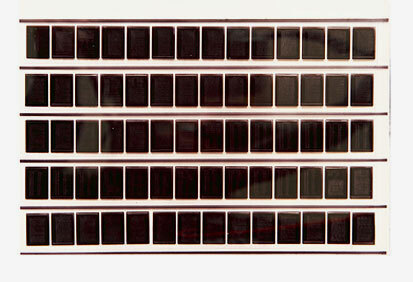 There are multiple types of configurations for an image matrix of a 16 mm and 35 mm Microfiche. Sometimes a frame may consist of two A5 (210mm x 148mm) pages or two A4 frames may be replaced by a single A3 (420mm x 297mm) page. All microfiche are read with text parallel to the long side of the fiche. Frames may be landscape or portrait. Along the top of the fiche a title may be recorded for visual identification. The most commonly used format is a portrait image. 16mm Microfiche were used for office size papers or magazine pages. The Microfiche are stored in open top envelopes which are put in drawers or boxes as file cards, or fitted into pockets in purpose made books. Used to archive A3/A4 documents. Size is 6 x 4 inches. Can contain 60 pages per microfiche. Often used to archive large engineering plans, construction plans and newspapers. The word COM Microfiche comes from the abbreviation of Computer Output Microfilm (COM), this type of Microfiche is one of the most common. They are produced by specialised equipment that reads the data in a print format and burns that data via laser. Standard microfiche are either 42 or 48X which equates to 208 or 270 pages of data respectively. Computer Output Microfilm (COM Microfiche) technology has been around since the 70's and is still used today, mostly by organizations who need to store payroll, accounting, insurance, inventory, or employee data. Used in a corporate environment to store and archive mainframe or computer generated reports and data. Widely used in the vehicle manufacturing industry to archive large vehicle parts lists and drawings. Contains up 270 pages per microfiche. Combined or COMBI are microfiche that contain a mixture of 16mm and 35mm images. COMBI microfiche are used mainly for mixed types of documents mounted or printed into an A4 size fiche. Contains both 16mm and 35mm images. Mainly used in the building industry and local authorities. Contains mixture of A3/A4 drawings and plans. Deterioration of Microfiche files. There are many ways Microfiche can get damaged: handling, bad storage environment. In our experience here at Pearl Scan we have witnessed many cases where complete Microfiche archives have been lost due to these factors. Film fades through exposure to UV light and becomes scratched through continuous usage. In most cases the image quality declines or is just not possible to scan any information from it because of the state of the microfiche. Access to Reading. Getting access to the information in Microfiche can sometimes be a hassle. You need to look for them in boxes or inside cabinets and then load them into a Microfiche reader to find what you're looking for. This process can take hours. Is this a process that you have to go through constantly? Imagine how much time you will be saving if you digitalise your Microfiche files. Microfiche Readers' Hardware. Many companies don't have a working reader any more and the cost of acquiring a new Microfiche Scanner will be a similar price as the cost of digitalizing the Microfiche. Storage. The idea of storing Microfiche may be considered obsolete, but the data stored in the microfiche may be vital for your company. Storage space can be maximised by changing from multiple boxes of Fiche to a couple of CD's. Save on costs and time spent on recovering and storing files. No more time wasted searching through film reels and microfiche slides to find one particular file. Documents and records can be kept safe and backed up electronically many times in lots of different locations. Access any filmed document instantly without leaving your desk. Create more office space by removing any boxes of film reels and drawers of microfiche slides. Historic public records could even be uploaded online for the public to view which saves time on retrieving records at the office. Archived scanned documents can be stored on a network so that relevant staff can access electronic files at any time because documents can be distributed easier electronically, via e-mail or online hosting, eliminating the need to print, post or fax them, which saves on costs. Microfiche are sent to our offices via courier or Royal Mail Special Delivery or we can arrange for them to be picked up by our secure courier. Upon delivery to our head scanning bureau, our experienced microfiche scanning staff use top quality microfilm and microfiche scanners while carefully checking the quality of each individually scanned document after conversion. Once the microfiche and microfilms have been scanned, the digital files are converted to whichever electronic format you prefer. They are later enhanced and each document is indexed to your specific requirements. This way you can quickly locate any required documents easily. How do we guarantee our scanning service? We are a Document Scanning Company that specialize in Microfiche Scanning with more than 10 years' of experience in the UK. Our team is committed to following the strictest quality controls to guarantee that your information is in the best hands. That's why we are the Scan-do People. Through this 10 years, our scanning solutions have been certified with ISO standards and many accreditations to back up our work. Read more about our accreditations. What are the Formats we can convert Microfiche into? Our scanning process is fast and accurate, our microfiche scanners can convert your Microfiche library in no time, saving you time in money. We can index your microfiche and convert them to these formats: PDF, Searchable PDF, Microsoft Word, TIFF and JPG. 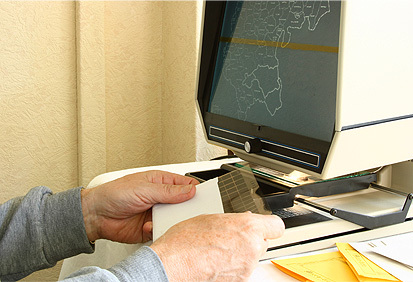 With more than 10 years providing Microfiche Scanning Service in Manchester, London, Birmingham as well as the rest of the UK, we have gained valuable expertise and attention to detail. We will adapt to your needs as we take each project as an individual and customize our service to offer the best result possible to your scanning needs. Our quality control practices guarantee an excellent output from scanning for better character reading (OCR) and indexing. We also brings search and retrieval function to your Microfiche reading needs. If you are interested in reading some articles about microfiche scanning, visit our blog. Why Should My Microfiche Be Digitised? We offer a free trial scanning service to our prospective clients to their required format as proof of concept.